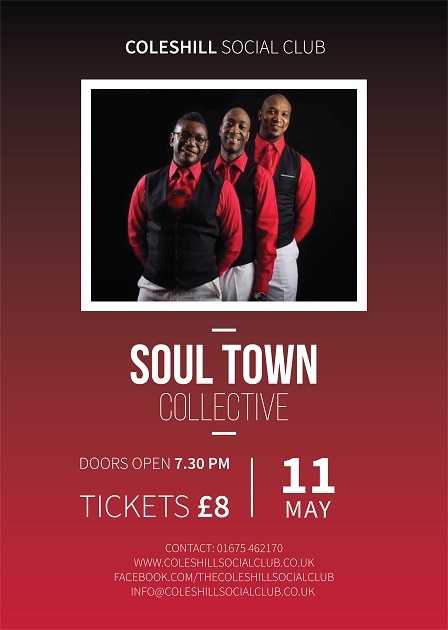 SoulTown Collective are one of the UK"s premier Motown acts, they are veterans of the industry with a fully choreographed show to give you the live & authentic Motown experience. Previously know as The Brothers of Soul, all talented male vocalists in their own right, individual vocal styles and intricate harmonies combine to deliver a contemporary "up to date" feel on the Motown classics performed by artists such as; The Temptations, The Drifters, The Four Tops, The Isley Brothers, Stevie Wonder....and many more. Age limit is 12 years plus. Tables over 6 seats can be reserved if you make entertainment committee aware in advance.